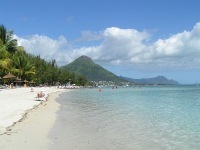 Once a small fishing village, Flic en Flac has grown to become a popular holiday spot in Mauritius. Located on the west coast of the island and linked by road to Port Louis, the town's long and beautiful white sand beach is protected by a lagoon that makes it perfect for watersports like waterskiing and scuba diving, and there are great dive sites including caves and wrecks nearby. Accommodation in Flic en Flac caters for all budgets with a good selection of self-catering accommodation alongside stunning luxury hotels. There is also a prominent golf course nearby, as well as a casino for those who fancy a flutter. For a unique excursion, visit the nearby sugar cane estates which offer tours during cutting season, from July to November. Tourists will find plenty of little souvenir shops and stalls along the beach and there is a big supermarket for self-caterers. Many hotels have their own shops. There is also a pharmacy, an internet cafe, and a shopping centre. There is a large selection of restaurants in and around Flic en Flac, with some impressive high-end hotel restaurants as well as plenty of local options for budget travellers. Flic en Flac is one of Mauritius's most developed and popular resort areas and the nightlife is more exciting than most of the smaller, more secluded resorts. There are a number of popular bars and even a casino, many of the hotels have their own clubs, and Port Louis is just a 30-minute drive away. However, Flic en Flac is not yet as big a party resort as Grand Baie and those in search of a pumping holiday clubbing scene may still be disappointed. Flic en Flac is a haven for watersports enthusiasts and visitors will find that it is possible to try most exhilerating water-based activities along the stretch of beach, including waterskiing, boating, fishing, and diving. Although Flic en Flac was once a great snorkelling destination, the coral reef has seriously degraded over the years; however, it is still a good spot for scuba diving. There are lots of fun land activities too, like volleyball and tennis. The long beach is perfect for walks and the protected lagoon area ensures peaceful and safe swimming conditions.